Today I'm posting my 300th post on this blog. It took me almost 4 years to complete my 300 th post. It's quite a big achievement for me, I'll say. It's nothing but the love of blogging and sharing that keep me going and off course there are so many wonderful food bloggers around me who motivates me every day and don't let me stop. So I keep going, keep sharing and keep experimenting with food and keep learning about food in daily basis. I'll take this opportunity to thank all my fellow bloggers, friends and family members who always encourage me and support me. After being a part of this food blogging world for almost 7 years, I have tried almost all kinds of cooking techniques so far, like baking, microwave cooking, trying out International recipes and so on, but one thing I was so scared to try was Yeast baking, baking bread with yeast. I have heard many failure stories about yeast all along, even I bought couple of times packs of yeast to try out something, but couldn't gather courage and then finally I threw the yeast. 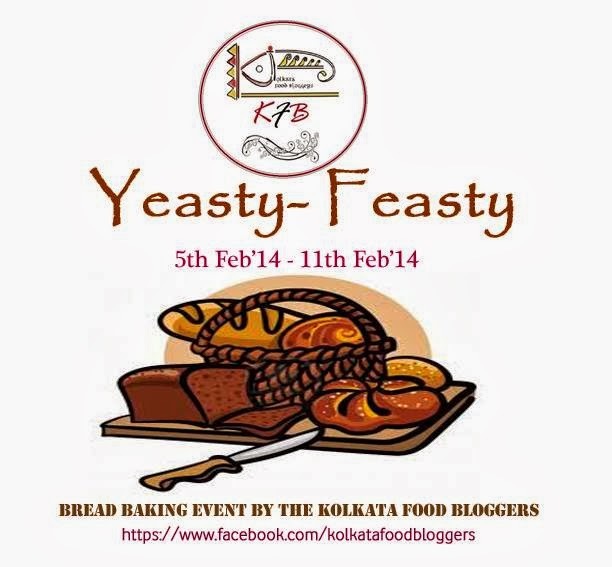 As you all know I'm part of Kolkata Food Bloggers, who are organizing events every month on different topics. This week it is "Yeasty-Feasty" bread baking event. As soon as I heard this, my first reaction was "No way". Meantime, other members started psoting their bread recipes, seeing them I somehow gathered some courage and thought myself, "if it not now, then never". I had a bottle of yeast at home lying for some time. After reading lots of articles and recipes on the web and gathering some useful tips from my fellow bloggers, I set out to bake bread with yeast few days back. My first attempt went totally flat, as the yeast I was using was not good enough to bake a bread. In my locality, it is hard to find a good quality yeast. If you have a good quality yeast, then rest will fall in place if you follow the procedure. This time I was determind to nail this bread baking business. On the very same day, I found a link on Nishamadhulika.com, where she explains how to make fresh yeast at home. I immediately set off to make fresh yeast at home. All the ingredients were also handy and I made my yeast and as I said if you have good yeast, nothing can go wrong. I was pretty nervous but following her process word by word, I successfully baked some bread for my family. Yooooooooooooohoooooooooooooo, I finally did it. 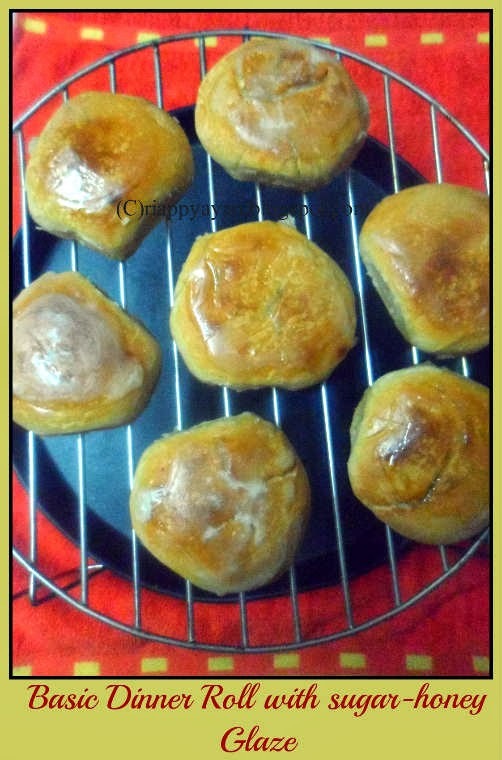 You need only 4 ingredients... All Purpose flour(maida) : 1 cup, yoghurt(dahi) : 2 tblsp., sugar : 2 tsp. and aniseed/fennel(saunf) powder : 1 tsp. Process : In a bowl, take maida, add curd, sugar and aniseed powder. Mix well and add 1/2 cup lukewarm water and make a batter. Now this is the important step, beat this batter for at least 5-6 minutes and make sure no lumps are formed. After beating for 5-6 minutes, you'll see some bubbles forming on top of the batter, then you are done. Keep this batter in an air-tight container or cover it with a plastic wrap or kitchen towel and keep aside for 18-24 hours. After 24 hours you will see some bubbles on top, that means yeast is formed. You can preserve this batter for 7 days in refrigerator. Milk, in room temperature : 1 tblsp. In a bowl, I took 1/2 cup of freshly prepared yeast(rest I kept in refr. for future use), to that add 2 tblsp oil, suagr and salt and mix a little. Then add sieved maida(flour). Add just enough lukewarm water, make a smooth dough than a dough we usually prepare to make chapati. You keep on kneading the dough for 5-6 minutes. Knead until your dough doesn't stick to your hand and becomes very soft, smooth and oily. Place the dough in a well-greased bowl, cover with a plastic wrap or kitchen towel and keep the bowl on a warm place to arouse the yeast. I kept mine inside a microwave keeping the light on. It takes at least 4 hours to double up the dough. Imp. Tips : After 4 hours, check the dough, pock one or two finger on the dough, if it doesn't fill up, then the dough is ready to bake bread. When the dough is ready, take out of the greased bowl, on a plain surface, knead again for 2-3 minutes to let the air out of teh dough but do not punch on it. If you see, the dough has becomes sticky, sprinkle some flour and knead to make a soft dough. 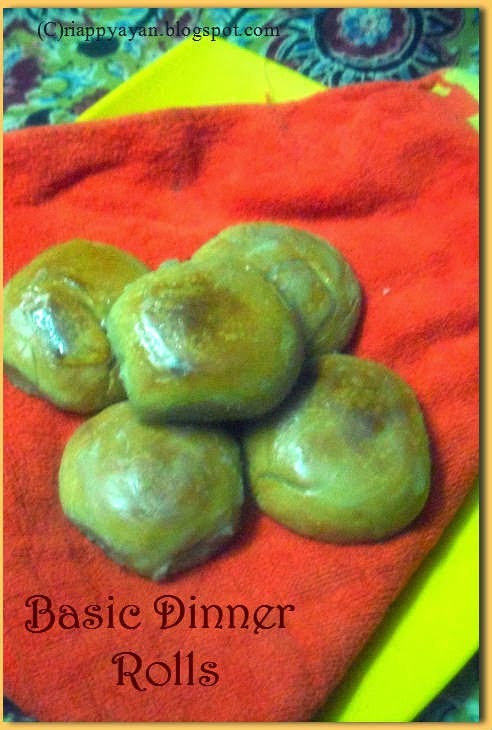 Make similar sized round dinner rolls out of it. Grease a baking tray or pan and arrange the round ball on it. Let them rest for another 45 minutes covered with a plastic wrap or kitchen towel. When done, brush the dinner rolls with milk, the step will help to brown the breads on top. Preheat your oven to 175 degree C and place the baking tray and bake for 20-25 minutes. If you want your dinner roll to brown little more from th top, then put the baking tray in grill mode for 10 minutes. Imp. Tips : take out one dinner roll and tap on it, if it gives a hollow sound, then it is done. Remove from oven and cool slightly. You can use as ti is and can use the sugar syrup-honey glaze on top for some extra flavour. In a pan, add water and sugar and boil until sugar syrup thickens. Remove from heat and mix honey in it. Brush this sugar syrup-honey glaze on top of each dinner roll. Let them cool. 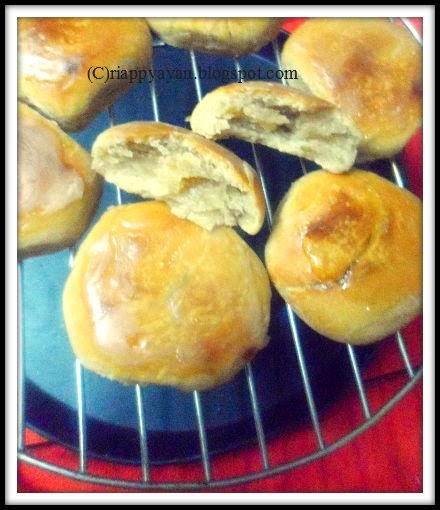 I am sending this recipe to Yeasty-Feasty Event of Kolkata Food Bloggers. Food Bloggers from all over the world can join in with their Yeasty Bread recipes. Click here for more information! I like your food guide. Thanks for hosting this.